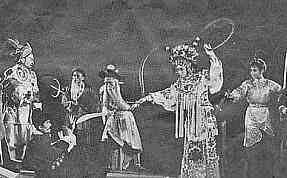 After leaving Longgai Monastery Lu Yu joined a travelling performers troupe as a comedian. Though not blessed with good looks and spoke with a stammer, Lu Yu was brilliant, witty and eloquent. He later authored three books on comic sketch and became a well respected comedian. His brilliant, witty acting and humorous play together with his skill in brewing tea won him many friends and made him a popular person with many Jingling officials. Year 746 Li Qiwu a member of the Tang royal family and a senior official in the imperial court was transferred to Jingling as prefecture governor. Jingling was a lesser city so in having a royal member as their governor was an honour for the city folks. However it was not the case for Li Qiwu whose transfer was the result of being a victim of backstabbing by Prime Minister Li Linfu, another member of the royal family. To welcome Li the city folks and officials of Jingling organised a function to honour their new governor and obviously Li Qiwu was a popular official. In that function Li Qiwu was surprised to see a young comedian in the play. Nonetheless Li was blown away by this young performer's wits and talent. Impressed by Lu Yu's performance Li Qiwu invited the young Lu Yu for a meeting. Ever since then Lu Yu became a regular guest of Li Qiwu. Later Li Qiwu discovered some extraordinary quality in this young man. Li Qiwu was amazed with Lu Yu's talent and ability and above all this young chap's insatiable appetite for learning. Li Qiwu presented Lu Yu some books and suggested to Lu Yu to leave the performers troupe. For Li Qiwu a fatherly figure to Lu Yu was prepared to sponsor Lu Yu for further studies under an old friend, senior scholar Zou Fuzi. Zou Fuzi was a retired imperial court official and a highly respected senior scholar who had reclused from society and lived in solitude in Huomen(now Fozi) mountain north-west of Jingling. This was a rare opportunity for Lu Yu to be trained by a great guru. So he quickly thanked Li Qiwu for his kindness and gladly accepted the offer. Lu Yu armed with a recommendation letter from Li Qiwu happily headed towards Houmen mountain to meet his guru Zou Fuzi. This gift from Li Qiwu was the first step towards the beginning of a new life for Lu Yu. The transformation of an ordinary orphan boy to a young man of letters.